(Newser) – A University of Michigan sorority whose members popped balloons as part of a team-building event has apologized for triggering an "active shooter" alert on campus. The balloon popping occurred March 16, at the same time a vigil was being held nearby for victims of the New Zealand mosque attacks a day earlier. The alpha Kappa Delta Phi chapter issued an apology in a letter published Sunday in the Michigan Daily. Members said they're "truly sorry" and should've been more "more cognizant" of their actions. 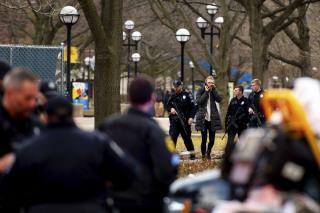 Alerts issued by the Ann Arbor school told students near Mason Hall to "run, hide, fight." Authorities later said there had been "balloon popping activity" in the area and there was no "malicious intent," the AP reports. The letter says sorority members stand "in solidarity with our fellow Muslim students and marginalized communities." "We have used this past week to not only process our feelings of guilt and disbelief, but to also reflect on our mistakes and take responsibility for our actions by reaching out to members of our immediate communities," it says. It's pretty obvious this sorority is anti-Muslim. They should be immediately expelled from school and all chapters of the sorority disbanded. We should not tolerate this kind of hate. What's next? Those little popping things at New Years? What if someone sets one of those off and someone gets scared? Not to mention I bet those little mini-kazoo thingies probably sound like a machine gun. Our country has become so pathetic - how does some kids popping some balloons turn into an apology to Muslims and reaching out to other communities? Just because people have become pansies over nothing, doesn't mean that people popping balloons is anything to apologize for. If you confuse a balloon popping with a gunshot then you've never heard a gunshot before. Gunshots are really, really, really loud. So loud they can't really be captured in a recording, and if they could then people would go deaf watching movies or TV.